LATISSE ® (bimatoprost ophthalmic solution 0.03%) is an FDA-approved prescription treatment for Hypotrichosis (inadequate or not enough eyelashes). Each kit includes medication and disposable sterile-tip applicators. 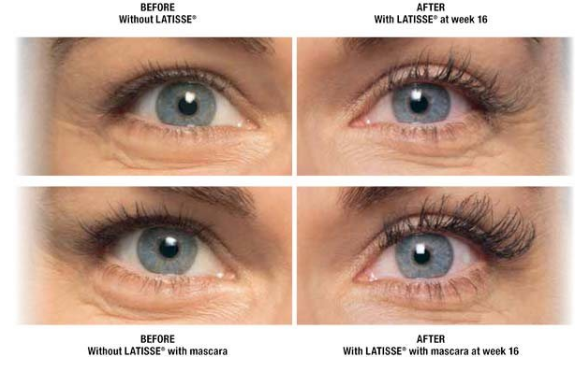 LATISSE is a prescription medication, therefore a consultation must be completed with our MedSpa provider. Contact us below or submit an online consultation form to learn more about how we can help you grow longer, thicker, and darker eyelashes. We offer free consultations and our medical providers will work with you to develop a treatment plan that will help you reach your beauty goals! LATISSE is only applied to the upper eyelid. Do NOT apply to the lower eyelash margin, as it is passed from upper eyelid to lower eyelid when blinking. Once every night, place one drop on the sterile applicator. Apply it evenly to the skin of the upper eyelid margin at the base of the eyelashes. Dispose of the used applicator. Repeat the process on your other eye with a new sterile applicator. It is important to never reuse applicators or to use any other brush or applicator with LATISSE. You’ll see the full effect at 16 weeks. It is important to continue applying the solution and follow the directions to achieve the best results. If treatment is permanently discontinued, the eyelashes will return to their pre-treatment level. For more information, please see the “Latisse consent form” form in the box to the right. Our providers will work with you to minimize discomfort and/or side effects. Most clients are able to take LATISSE, however, anyone using intraocular pressure-lowering eyedrops for glaucoma must consult with their ophthalmologist prior to treatment.